I have heard many people tell me that Twitter is just a passing fad. Interestingly these same people are the generation who, in the 50’s and 60’s, became rock and roll junkies despite their parents generation asserting that it was only a fad. Now they have become their parents. I hate to bust their bubble but social media is here to stay and Twitter has become a big part of social media. I also know many people who are using Twitter because it has a more friendly smartphone app than Facebook. Business Insider reports that over 60% of social media time is spend on portable devices and not PC’s. With stats like that Twitter is a marketing tool that is to powerful to ignore but it has to be used in a planned way. Facebook is also a social marketing tool but is to cluttered to be a real effective marketing tool, unless you are buying ads. Twitter, when used effectively, is probably one of the most positive and cost saving marketing tools to present itself in a long time. Plus it compliments your Facebook page very well. However one must understand it is only “one” tool that needs to be included in any businesses social media plan but I do need to stress the word “plan”. By itself Twitter is just an echo in the world of social media. It needs to be focused, targeted and used to promote other aspects of your social media plan. I have people call me almost daily to ask if I will handle their Twitter account. These are small businesses taking their first steps into the world of social media and understanding that world can bring great rewards to the small business owner. But 9 times out of 10 when I ask who their target is they have no idea what I’m talking about. At this point the conversation changes from “Do you want to hire me to handle your Twitter account or are you looking for someone to teach you about social media?”. Two different services with two different costs. Imagine as a small local restaurant being able to make all of the businesses around you aware of your lunch specials two hours before lunch. Those same local restaurants no longer have to depend on weekly flyers in the mail (80% wind up in the garbage anyway) to advertise their daily specials. Plus that idea you had on Monday for those weekly lunch special and you advertised in some local flyer may have changed for any number of reasons by Thursday. A quick tweet to those following you can address that issue. And by simply sending the message to, for example, @NanaimoChamber in the proper form rather than @johnsmith you can connect with all 2,725 followers of the Chamber of Commerce rather than the 57 followers of john smith. Take it a step further and every local boutique-type business can open their doors to every tourist who visited your shop. With the proper use of your Facebook and Twitter content you can now reach that tourist who passed through your shop in July to make them aware of a Christmas special. Welcome to the world of e-commerce! Those same tourists, when they get home with some neat little thing they picked up, tell their friends “Oh I got it here” and pass on the Twitter address. Or better yet they take a camera phone picture and post it immediately to their Twitter account. What better way (and inexpensive) for any local artist to promote their work? Not getting a wheelchair through there. And if you think no one is paying attention, think again. 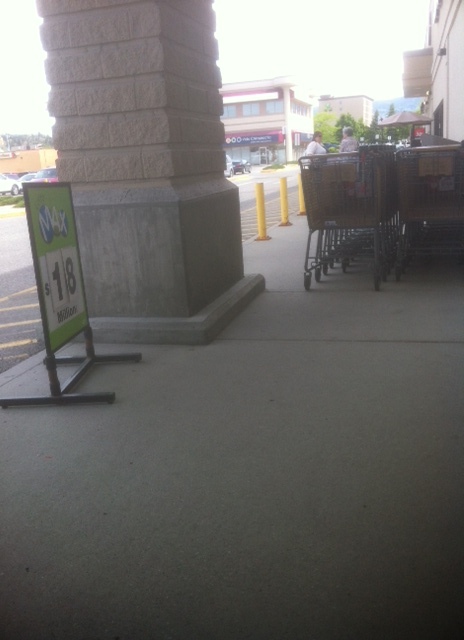 I recently took this picture at a Safeway in Kelowna. I tweeted it from my phone immediately with a short caption about not having room to get my wheelchair through that opening. I made sure to include @safeway in the list of accounts. I had a response from the corporate office of Safeway within two hours asking me where this store was. I responded, they contacted the identified store and corrected the issue. How often do you get a 24 hour resolution? Twitter is a valuable tool to any business but for small business it is an unpolished gem. I don’t know of too many small businesses that have thousands of dollars to invest in marketing. Twitter is a way for them to grow their business inexpensively by reaching the world. It’s not a fad and it isn’t going away. With that said it is not a Facebook type tool and requires a strategy to make it effective. I know as many people who picked up an account, send three tweets and then never went back. Twitter isn’t designed to let everyone in your network know about the latest shoes you purchased and where you found them. It is designed for taking a picture of those same shoes and tweeting that picture with a quick message saying “get them now before they’re gone”. As I have said before it’s not build for conversation. In 2013 Twitter’s SEC disclosures, prior to issuing their IPO, the company said it has 232 million users. But those aren’t its total number of registered users. Instead, they are what Twitter calls “monthly active users.” Twitter obviously isn’t for everybody but when used effectively it is a powerful (and did I mention inexpensive) tool. This is too big of an audience to ignore. Are you maximizing your budget to get as much exposure as possible? This entry was posted in Entrepreneurship, Social media and tagged e-commerce, Internet marketing, Nanaimo business, social media, Terry Wiens, Twitter. Bookmark the permalink.